Hello fellow LOSTIES! Yes, the dreadful hiatus continues! It will be even more painful this week with all of the other shows starting to premiere this fall! Okay, maybe it will be less painful with Heroes and The Office filling that empty void! (if you're not watching either of those, there's my plug!) Anyway, I have been hearing rumblings about people wondering where Mike has been and when that next blog would be coming! My answer? There has been nothing to update you on! But, I feel your pain, and am itching for some news myself! And I guess the producers realized this too as they conducted a Podcast that was released Saturday September 22nd 2007, the 3rd anniversary of the crash of Flight 815. They surprised us with a special Q&A in which they actually called up some fans that had sent in questions and answered them during the Podcast. I thought, to help fill the void, that I would share the Q&A with you below. Also afterwards there are some random news blurbs I added that I have heard. Enjoy! SPOILER ALERT!!! Just a note, I consider anything the producers told us to be MILD SPOILERS. They would never give anything away that could ruin the experience for their viewers. But, if you don't want to know anything about season 4, STOP READING NOW! Question: Do you have a definitive plan for the Sawyer, Kate, Jack Love Triangle? Answer: Supposedly Damon Lindeloff and Carlton Cuse each support one of the pairings. There are the JATERS (Jack and Kate) and the Skaters (Sawyer and Kate), but Darlton (yes, Damon and Carlton) will not say which one supports which pairing. Even though they both have their preferences, they have ultimately agreed on who Kate will end up with in the end. They emphasized that it is not a resolved story (at this point in the show) by any means. And also they stated one more time that the Flash Forward we have seen is not the end of the show by any stretch of the imagination. There is lots of story to tell beyond that. Question: As for the Flash Forward, is this only one possible occurrence of the future? Or is it a definite occurrence? Answer: Darlton, to my extreme excitement, stated that they are not big fans of multiple futures. What we see about the future is the defined future. So throw out any theories you had about them changing something in the past and it changing the future. I've been a long subscriber that they already have a complicated story to tell without getting into the complications that time travel can bring a story. However, Darlton did state that this doesn't mean that the ability to travel through time will not continue to be a theme on the show. But they state that the rules of TIME they follow are the exact rules that Mrs. Hawking explained to Desmond during his travel into the past. The Future is FIXED, no getting around it. Anything you change in the past will ultimately not change the future. Question: The actor who plays Richard Alpert (Nestor Carbonell) is on the TV Show CANE now. Richard Alpert seemed to have grown into a pretty essential character by the end of season 3. How will you work around this? Answer: Darlton acknowledged that they put a lot of work into the character of Richard Alpert with him first appearing to be Ben's 2nd in command, and eventually learning that he was not part of the DHARMA Initiative but a NATIVE or ORIGINAL OTHER. Unfortunately, real life intervenes when doing television and they have to work around these problems. They ran into a similar situation with Harold Perrineau (Michael). They wanted to bring him back in season 3 but there were commitments Harold could not get out of. But his story will resume in season 4. The story of Richard Alpert is parked for the time being but Darlton are hopeful to return to his character but it depends on what happens with CANE. The silver lining? Even though CANE will air on CBS, it is produced by ABC Television studios. Rest assured, there is an extensive plan for Mr. Alpert. Question: Are Nikki and Paolo really dead or will that story continue? Answer: They're dead. Story is done! This was a situation where the producers were doing damage control. The audience didn't buy Nikki and Paolo being on the island the whole time and us just not seeing them. They had a long running story arc planned for them, but instead wrapped it all up into one episode. (Translation: NO MORE THEORIES ON THIS!) I personally think they did a good job with it! Question: Is Kate pregnant with Sawyer's baby? Answer: The actual premiere date in February is still up in the air, but with the show premiering some time in February it is safe to assume we'll probably have an answer to this question by March (Damon's exact phrase? "The Ides of March"). They hinted at possibly 4 episodes into season 4, we'll know. Question: Are we going to find out if Mikhail is still alive? Answer: We've been fooled on this before but Darlton confirms that this time he really is dead. But this doesn't mean he won't be on show (flashbacks). After all, we still need to find out how he lost his eye! Well, that's the Producer Q&A! Hey, I'll take anything I can get at this point! If you haven't been reading the comments of previous blogs (which I occasionally post newsworthy information in), Season 3 of LOST will be available on Blu Ray in addition to standard DVD (release date December 11th!) So, all of you early adopters out there like myself can enjoy LOST in pristine HIGH DEFINITION! Doesn't it just give you chills thinking about it? (MILD CASTING SPOILER) I'm sure everyone has also heard that we will be hearing from LIBBY again in season 4, probably in the form of more flashbacks. They have been able to work out some scheduling issues with Cynthia Watros. Darlton had stated previously that certain events needed to take place before they could revisit Libby's story, but now they seem to be in a place to do that! I know the question of why Libby was in the Institution with Hurley still has everyone's curiosity peaked! So, I'm sure a month or so will go by without any more blogs from me and people will start emailing each other saying "Yo, when is the LOST Guy going to update that Blog again? I'm going crazy!!!" My answer as always....when I have information to share! Hopefully those Fall Mobisodes will be starting soon and they don't just fall off the radar like they did last season. I haven't heard much about them lately. But if they're available, I'll definitely plan on writing something about them! 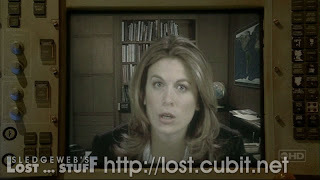 Other than that, subscribe to The Official Lost Podcast through Itunes or just listen at lost.abc.com. And you'll have any information I do as well! And as always, keep spreading the word about the Blog! Hopefully, we won't have LOST any momentum when February rolls around! We had some really good discussions near the end of last season. Looking forward to that continuing! I hope I was able to give you a bit of a LOST fix during this TV premiere Week! In the meantime, enjoy the premiere of Heroes tonight and The Office on Thursday. Oh yeah...and Friday Night Lights October 5th on NBC! Help save one of the best shows on TV besides LOST! And with that, see you in the well-defined and unchangeable future! Well....that should hold us over for 9 months, shouldn't it? That was one super crazy TWISTY/TURNY spectacular ride of an episode! And one WELL deserving of my very frequently handed out WOWs! One might say even the MOST deserving! I don't know how many WOW's need to be said though to explain the magnitude of this episode! Action, Suspense, Mystery, Romance, DEATH and a twist so crazy that it has everyone debating at what point in the episode they figured it out! (Motorola RAZR anyone?) The producers claim that they don't want to be safe because that's when they become predictable. Well...they took some giant risks with this episode, and we'll have to discuss the ramifications of it all below. But for now....all I can keep saying is WOW! So, anyone that has become familiar with the LOST Addicts Blogs will know that I can be a bit wordy at times! So, a recap of a 2 hour episode might imply that this thing is going to be extremely long! I'll try my best to make the blog readable! Let's get to work! Premise of "Through the Looking Glass": Jack leads survivors on an expedition to the Radio Tower to be rescued, Sayid/Bernard/Jin stay back to blow up The Others with a few setbacks, Ben does some plotting to sabotage the survivor's plan (For good or evil? remains to be seen), Juliet/Sawyer/Hurley return help Sayid and crew finish the job, Locke is "reborn," Charlie deals with his fate in the Looking Glass station with some assistance from Desmond, and we follow a "FLASH" about Jack throughout the entire episode. Should be simple enough to sum up, right? There were several events that occurred in the episode that triggered events in the main storylines, but not deserving of their own section. We'll try and sum them up here! 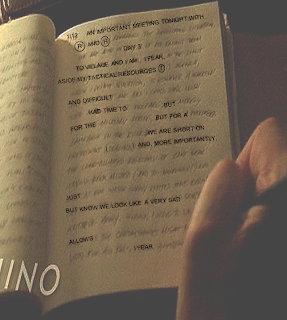 We have a shot of Ben writing in a Diary. There may be some goodies in these writings, but for now it's a little too much to decipher. Here is an initial attempt to decipher, courtesy of Sledgeweb (lost.cubit.net), of which we can be very thankful each and every week for their fabulous screenshots! 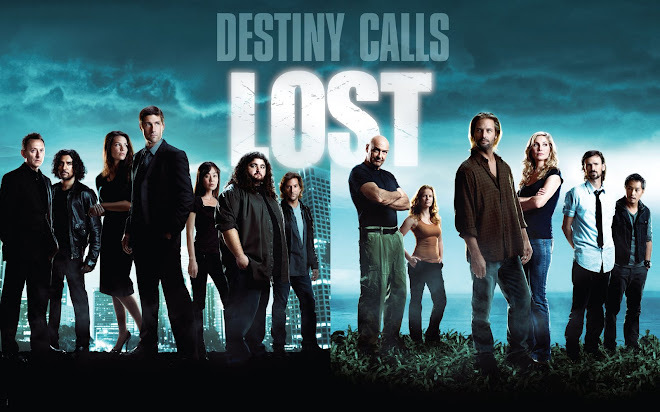 Through Radio communication Ben learns of Juliet's deception and gives an assignment to Mikhail to head to the Looking Glass to stop Charlie, and gives orders to Ryan and Tom to hold Jin, Sayid and Bernard captive until given further orders. There seems to be a general lack of trust with Ben though with the disappearance of Locke after their meeting with Jacob and also with the fact that he lied about the Looking Glass Station. Ben tells Richard to continue taking their people to the TEMPLE as planned. We do not see this temple. Was this a season 4 setup? Could this temple tie into the giant FOOT we saw in last season's finale? Ben says he will meet up with Jack and crew and CONVINCE them that they have to stay. This will hold more weight later in the blog! Ben also learns of Alex's deception and how Karl was an informant to the survivor's. He brings Alex with him to deliver her to her "NEW FAMILY." Ben insists to Alex that he CANNOT let the survivor's leave the island. He seemed pretty sincere with this statement. Does that mean everything he tells Jack and crew is true? It's really hard to believe ANYTHING Ben says! Our prior suspicions seem to be correct of why Ben wanted to keep Karl and Alex apart. He was afraid of Alex getting pregnant. We revisit Locke in the DHARMA Grave about to shoot himself in the head to end his pain. WALT shows up! An older looking Walt (well duh Malcom David Kelly has kept aging!) telling Locke that he CAN get up and that he has work to do. Locke had claimed that he could not move his legs. Had he lost faith in the island? Was the vision of WALT a message from Jacob? Or was it really Walt? The producers had said before that they have addressed the "WALT" aging situation. If this is true, we did not get an explanation in this episode! 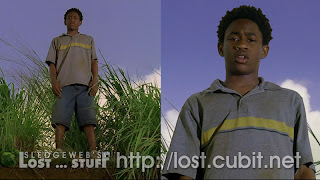 Also note that Walt's clothes are brand new and are nothing that he wore when he was ON the island. Maybe we are to believe that WALT does have the ability to appear to people? Still a mystery folks! Speaking of Michael and Walt, I believe someone may have commented on this in a previous blog, which is why it's stuck in my head....if they left the island and were rescued, then why would people OFF the island still not know there were survivors of flight 815? And what about Locke being shot? He still seemed to be limping and holding his chest later in the episode. Are we to assume he is just going to heal from this? Sawyer asks what were those rocks for on Alcatraz 2.0....Juliet says they were building a runway. Then jokingly says "for the aliens." If it was a runway they were building, what is the runway for? Then again, the whole thing may have been a joke. As there probably were crazy theories out there that there is some ALIEN connection to the Island and that the OTHERS are building a runway for their UFO. I wouldn't put it past any of the crazy theorists out there! But...probably still worth mentioning, even if the RUNWAY thing was a joke. Speaking of runway, this caused me to have some random thoughts. There was the speculation after the Ben flashback that the DHARMA initiative might have had a PLANE, but then we dismissed this as a closed captioning error thinking that they meant the "FLAME" Station. Of course, now thinking about this more, where are the DHARMA food drops coming from? Are they coming from OFF the island somewhere where people still believe the DHARMA initiative is still up and running? And of course, if the food drop came somehow from ON the island, then wouldn't they already HAVE a runway? Hurley wants to help rescue their friends but Sawyer rejects the offer. Sawyer, like Charlie, implied that Hurley was too FAT to be of any help. He'd just get in the way. These comments may have saved them all! Best joke of the night: Sawyer "So, are you screwing Jack yet" Juliet's comeback "No, are you?" Good times! We learn that the OTHERS defy Ben's orders to kill our trio and that they shoot 3 shots into the sand. Now, I'm not sure who said what but either Ryan or Tom said that they should've just killed them. And the other said that Ben has been acting fishy. I THOUGHT Tom was the one that was siding with the survivors, but I heard the opposite on the radio this morning. I guess, in the end it doesn't matter. Because they're both gone! It may just impact your feelings on Sawyer!I'm sure I wasn't the only one cringing as that gun was pointed at Jin. I was relieved but very fired up at Bernard for spilling EVERY single piece of information to the OTHERS (and Ben via Radio) about what the survivors have been up to! I almost wished they shot that crazy dentist! Fortunately for him he was redeemed! Yes, since Juliet lies about the guns (it was the only way Jack would let them go) Sawyer and Juliet have no plan to save Sayid, Jin and Bernard......but then you hear a familiar sound coming from the jungle. Who else screamed "HURLEY!!!!" at their TV before the DHARMA van flew out of the jungle and right over RYAN? Totally didn't expect that turn of events. But it's fantastic how relevant the Hurley Flashback episode became (and it seemed so irrelevant at the time) after this episode and Ben's flashback episode. I mean, it's almost like the writers HAD a plan, isn't it?! Like we never should've doubted them, right??!!! COME ON PEOPLE, you know who you are!!! Now, keep in mind Tom has come a long way since we first met him. We thought he was the LEADER of this ragged band of OTHERS who just happened to have a fishing boat and and some interest in WALT and Claire's unborn baby. He was nothing but nice to Jack and Kate when they were captured by the others. But he mocked Sawyer in the Cage and he also threatened Kate's life in the jungle when Jack, Sawyer and Locke were going after Michael. If you recall...Sawyer made a comment to him "You and Me ain't done, Zeke" Well....they indeed weren't. Just as TOM surrenders, Sawyer shoots Tom "That's for taking the boy off of the raft" .... People questioned Sawyer's motives for going after the Others in season 2 (Michael, Jack)....and that he just wanted revenge for being shot. Well, it seems that all he wanted was revenge for them taking Walt. This all wrapped up nicely by Hurley's "Dude, he surrendered" and Sawyer's "Well, I didn't believe him." What a show! We may have predicted the majority of people that were going to die....but I never saw any of them coming! Well, after last week's introduction to the LOOKING GLASS station, I may have gotten ahead of myself with all of my crazy thoughts on the possibilities that we may learn from this station. None of which were revealed tonight. Instead, the station's purpose was just as Juliet explained...they were jamming communications with the outside world. Nothing further was revealed about Desmond's premonitions except that he stopped having them, but his final one pans out exactly as he describes with some pieces filled in. But what we get is an engaging tale of heroism and acceptance. But who were those crazy women that were holding Charlie at gunpoint? Well it would seem that they were just 2 random OTHERS: Bonnie and Greta. They were under direct Orders by Ben to continue Jamming communications with the outside world. 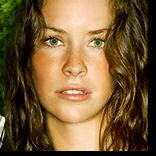 The rest of the OTHERS clan were under the assumption that the 2 women were no longer on the island, but in Canada? Interesting stuff. Mikhail arrives at the looking glass and shoots at Desmond which inevitably drives Dezzy down to the hatch and hides trying to figure out how to save Charlie. And of course Mikhail goes down to the underwater hatch as well for a lovely showdown under the sea! Charlie tries to create some mistrust (or actually is just being honest) with Bonnie, Gretta and Mikhail by telling them that Ben lied about the flooding of the Hatch. Why in fact DID he Lie? So now we have Charlie and Dezzy trying to get information from Bonnie on the code to enter to UNJAM communications. I lost track of writing down all of the numbers but that's okay...it's to the tune of Good Vibrations! I tried to think of any significance to choosing that song. But I got nothing except that the whole island vibrated when the sky turned purple during the Hatch implosion! But why on earth tie those 2 things together? Perhaps the key to the whole thing was that the code was programmed by a musician? Well, we only met 2 people on the island with musical talent (Charlie and Jack), so perhaps there is another? Ben is the only one remaining that supposedly knew the code. And we didn't see HIM learning any musical instruments. I'm guessing this "musician" thing is something to keep tabs on....even though in THIS episode it was just symbolizing that it was FATE that Charlie was the one that had to de-activate the jamming. Once the communications are unjammed, there is immediately an incoming message. From who? Well Penny Widmore of course! She just happened to be sitting in front of her "communications device" too? That seems a little crazy. Unless, we're to believe in all of this FATE stuff. Charlie and Penny have a nice little chat about Flight 815 (I think he mentioned that, right?) and Desmond. Naturally, Desmond couldn't hear Charlie screaming for him to show up. The KEY fact revealed was that Penny has no knowledge of Naomi or the ship that was sent. I guess we were right to assume Naomi was NOT an OTHER, but perhaps I was a bit ahead of myself to assume that she WAS not lying about being sent by Penny. (of course, I'm sure I covered myself in previous Blogs saying that perhaps Naomi is from a brand new group we've never met!) We'll discuss Naomi a bit more in the next section. For now though, if Penny didn't send Naomi then A.) How did Naomi know that Penny had coordinates B.) What is going on with the crazy guys in the Snow? Has Penny been trying to communicate somehow with the Island based on the information received after the "Electro-magnetic event"? Did the coordinates allow her to focus communications to a particular location? Or....is PENNY in on the whole thing too? We just assumed that Charles Widmore was in on any conspiracy taking place. What about Penny? So many crazy questions! Meanwhile Charlie thinks he has escaped the fate of Desmond's premonition until......woa wait a second! There's that crazy Mikhail again! (I mean seriously? How many fatal injuries can this guy withstand?) He's outside the window of the Looking Glass station with a hand grenade! Within seconds, Charlie knows what he has to do (as he looks at the Yellow Light that is no longer on). He closes the door as Desmond rushes towards him and allows the window to blow and fill up with water. Before we continue with Charlie, does this mean Mikhail died? I mean, you would think, right? I'm will assume it one more time! But if he turns up alive again...I give up! So big question: Did Charlie close the door because he knew it was the only way to save Claire? Or did he want to prevent the Looking Glass from becoming completely flooded perhaps trying to save Desmond? It could've been muti-purposed, but the most touching way to look at it is that he felt he HAD to make Desmond's premonition come true in order to save Claire. Fantastic stuff! The whole story of the Radio Tower expedition focuses on Jack and the survivors following Rousseau to the Radio Tower. Sayid tells Jack to keep moving and don't worry about anything that happens to them. DO NOT GO BACK. Things obviously go wrong and they don't see the 3 explosions nor do Sayid, Bernard and Jin catch up with the survivors the next day. As explained above, this causes confusion and starts rumblings of people going back. But Jack stays on the mission to RESCUE everyone! (as any true leader would!). Here's some tidbits of what happened on their journey! Kate and Sawyer discuss the possibility that Kate might be pregnant. Kate is clearly worried about it. Sawyer is too busy being a closed book ever since killing Locke's father. Maybe is what motivates him to go back and save the others. As for Kate being pregnant, well...stay tuned to season 4! Prior to Sawyer and Juliet heading out on the Rescue Mission, Juliet gives Jack a nice little smooch, observed by Kate. What is going on there? Clearly we got our answer from Sawyer and Juliet on what is NOT going on there! Jack and Kate have a moment in the woods where Jack explains that Sawyer was only trying to protect Kate by not wanting her to come. Why would Jack say such a thing? "Because I love you" Why did Jack try to rescue "Sawyer and Kate" from Alcatraz 2.0 by messing up the surgery? "Because he loves Kate" very touching stuff! It seems everything Jack, while for everyone's benefit, he has personally has done for Kate. Kinda like everything Charlie is doing if for Claire.To no one's surprise Ben shows up (with Alex) and asks to speak to Jack alone leading to one intense scene. Ben tells Jack that Naomi not who they think she is and that communicating with the freighter off of the island will only lead to 40+ people's deaths (kinda like Ben made a decision that would kill the 40+ members of the DHARMA Initiative). With us finding out that Penny has no connection to Naomi, it's hard NOT to believe Ben. But that dude is such a good liar! Plus, the storyline that I've YET to even focus on would seem to suggest that Ben IS lying! Ahhh this crazy show! Key thing that Ben does ask Jack though (and I believe I mentioned this in the 2nd blog this season) what is Jack so eager to get back to? His wife left him, his father is dead, does he want to get back to that hospital? This obviously plays a part in Jack's Flash. Alex and Rousseau FINALLY meet each other! Very interesting that Ben introduces them. We still don't know if Rousseau and Ben have ever interacted before! But what a great scene to have those two kids together and for Rousseau's first words to be "Will you help me tie him up?" ahhhhh gotta love Mother/Daughter bonding! Okay...fast forward some touchy stuff (everyone finds out Sayid, Bernard and Jin are alive and Hurley saved the day, Claire looks for an update on Charlie (will be an upsetting scene once she finds out what happened)) and we get to the Radio Tower! Rousseau ends the transmission and states that she started it 2 days before Alex was born. Immediately after the transmission is turned off, we get a signal and they make a call to Naomi's freighter. BEN gives one final warning...And then BAM, just like that a knife goes into Naomi's back. John Locke returns to try and end yet another chance at rescue! (I don't think a knife makes a BAM sound, but let me have that one! )Locke has the gun pointed at Jack but just can't go through with killing him. But man, after Charlie dying, I thought he just might pull that trigger for a second! Locke states something to the effect that "we are not meant to leave this island" but then walks away as the Freighter (or someone else) picks up the call. Jack: "We are the survivors of Flight 815! We're with Naomi!" Response: "Naomi, you found her? We'll be there in a few minutes!" Or something to that effect. And that's where we end our Present Day story for season 3. With the hope of Rescue, With the fear that it is NOT Rescue. 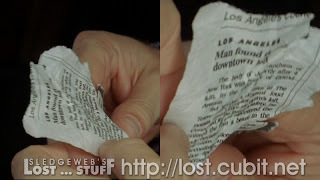 But even if they are rescued, would that be the end of our story on LOST? Let's dive into our final section to ponder the possibilities that were introduced! Okay, so when did YOU figure it out? Well, I had my speculations immediately from the 2nd flashback when I saw a Motorola RAZR phone in Jack's hand. This phone was NOT available at the time of Flight 815's crash. But in order to REALLY look at these Jack "FLASHES" we have to state upfront the reveal that happened at the end of the episode. Yes, in fact we were getting a sneak peak at Jack's life AFTER being rescued. It was indeed a FLASH FORWARD! I kept trying to figure out the timeline the entire episode. When could this have happened? Was he flying back from Thailand? Christian Shepard isn't the chief of Surgery? How is that possible then? What is up with that crazy Beard? Why is Jack a crazy DRUNK and Drug addict? Why is he suicidal? None of it made sense. I start thinking at one point that it was an Alternate reality where Jack never WENT to the island and how his life ended up. But each scene became much more relevant AFTER Kate stepped out of that car! Here are our NEW questions to ponder in LOST! First off - Jack refers to his father Christian Shepard in the present tense TWICE! He says to the new Chief of Surgery (Dr. Hamill - as in Mark Hamill?) to go upstairs and see how drunk his father is. Sure, this could've been a metaphoric reference to HEAVEN. Jack also claims that a perscription for his medication is from his father Dr. Christian Shepard who is "out of town." Maybe Drunk Jack is delusional? Or maybe there is more to look into with this? -------------- a beam in the"
Several times Jack is referred to as "THE HERO" that saved people in the crash and it was seen on the news. It was assumed that they were talking about the car crash. But looking back...it was probably referring to Flight 815. When they are rescued, Jack is probably referred to as the Hero that saved them all. As mentioned before Jack attempted suicide but ended up saving victims of a car crash (which was caused by Jack's suicide attempt). I just wanted to note that the crash was explained as a car being hit from behind into a median. The very SAME story that Cooper told Locke of how he ended up on the island. Is there relevance? who knows! We see a scene of Jack in his living room surrounded by Maps. Looking back, he seemed obsessed with finding that island and returning. So when Jack shows up to the Viewing, no one is there. He is asked if the person was friend or family. Jack said NEITHER. This immediately screams out Ben. Jack is clearly broken up about this person dying. Ben seems to have told Jack that they should not leave the island. Ben wouldn't have had any friends in the real world having lived on the island his whole life. And it wouldn't seem that anyone would want to show up to his funeral. But what about John Locke? If he was rescued, would he return to a life of being crippled and want to END his life? I read rumors that maybe it was ROSE, whose cancer came back (and she WAS from New York) when they were rescued. Speaking of which...Why did Rose not object to everyone going to the Radio tower?? Weird. Anyways....I'm going to guess that if this WAS in fact an ACTUAL depiction of life AFTER the island, then we're not going to find out anytime soon who was in that coffin. Because then it would pretty much tell us WHO survives the show! Of course...unless the upcoming seasons DEAL with LIFE after the island and attempts at getting BACK to the island! But I'm getting ahead of myself, obviously we need to discuss Jack meeting Kate at the airport and revealing all. Kate is clearly with someone else and thought it was best NOT to talk to Jack. It would seem that she is WITH Sawyer. But is that TOO obvious? Jack tells Kate that they never should've left the island and then BOOM.....LOST. Hmmm indeed what DID Jack have to go back to? He didn't get Kate, he doesn't have his wife (Sarah was in the episode and pregnant! still listed as emergency contact), father situation is even more clouded now, it doesn't seem he is needed at the hospital and his days of being a HERO are behind him (well, except for the car crash he caused). So what on earth is going on here? Are we seeing a hint of things to come? 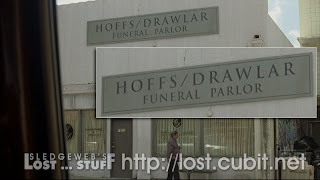 Are flashbacks finished on LOST? I don't think so....I think there is plenty of more story to tell with our remaining survivors (especially relative newcomer Desmond). Was this some sort of POSSIBLE vision of the future? (kinda like that Heroes episode a few weeks ago) Well, I thought that, but now not so much. What if next season they DO get rescued? What if we follow the events immediately FOLLOWING the rescue and then everyone's attempt to get BACK to the island? Of course...if they know where the island is and were able to Rescue Jack and Co....then why does Jack need MAPS or need to take random flights HOPING to find the island again? Or Perhaps Naomi's freighter presents the next conflict for the survivors and they do not get immediately rescued. Maybe we'll continue to have more FLASH forwards of life AFTER the island? And we'll learn how things end up this way? Perhaps the entire flash forward were visions placed in Jack's head? or maybe even a premonition from Desmond? We really could go anywhere with this! But the producers stated that after the season 3 finale, we will see exactly how there is so much more story to tell and how many more rooms to explore. INDEED, producers! As always, I'm totally on board!!!! Well, I think I've talked plenty! Hope you were able to read all of this without falling asleep! This is our final Recap Blog of the season. I hope everyone is encouraged to keep commenting throughout the "off-season" if you have any theories or read any newsworthy information! I'll try to post any blogs during the summer/fall if anything noteworthy happens! Until then....I hope you all saved this episode on your TiVo's because we have LOTS and LOTS of rewatching to do! I can't wait! Bookmark the blog and PLEASE COME BACK Next Season! As always hope you enjoyed my ramblings and I'll see you next year! Whew...Yeah...I'm stalling. I don't even know where to begin with this one. But I know all of you don't want to just keep reading all of this filler! Kinda like no one wants to watch Aaron get baptized while Charlie has crazy dreams of Claire as the Virgin Mary! (get it??? Because it was a filler episode? Man, I'm so funny sometimes!) Anyways...Here we go! "The Man Behind the Curtain" As Locke reminded us, it is a reference to the Wizard of Oz. Locke accuses Ben of being the Man Behind the Curtain, pulling all the levers and running the show. Of course, this ties in nicely to the fact that Ben pretended to be Henry Gale for half of season 2 (another character from the Wizard of Oz). This episode was all about Ben. The flashbacks focus on where he came from, and partially what inspired him to become the man he is now. And it might just reveal that he isn't the person running the daily operations of THE OTHERS (yeah, I'm not referring to Jacob here either). Speaking of Jacob, the episode also focuses more on learning about the mysterious Jacob mentioned maybe 2 or 3 times previously this season. For now, it seems we should believe that JACOB is the mysterious Man behind the curtain. And he will remain behind that curtain for the time being! And, of course, learning their lesson from episode's past...we didn't totally abandon our survivors in this episode. We see some small plot developments around everyone's suspicions of Jack and Juliet and FINALLY some heroic leadership from Mr. Shepard! And that's the easy part of the blog, so we'll start there! "I think we got some catching up to do"
There is more of the "Don't Tell Jack" theme going on. Jack has fled the camp with Juliet after Kate unveiled the Parachutist information. Sayid tells the whole camp about Naomi, who seems completely healed now (as Mikhail said she would be in 1.5 days). Everyone is up-in-arms about the world thinking they're dead. But there are more important issues at stake. Juliet's message is played for the camp. Loved when Sawyer and Kate made awkward eye contact when the part came on about "I'll have Austin's Sample soon." Amazing how much can be said with such a quick look! Ben's message? In 2 days, 3 Teams of Others will come to extract Sun. He asked Juliet to mark the tents of any other pregnant women. Ahhh....perhaps marking the tents will be part of Jack's plan for an ambush! It's gonna be a showdown for the ages! And it conveniently is scheduled to occur right around the season finale! Weird how that works isn't it? Speaking of weird, time to talk about Ben! Although, his flashbacks weren't TOO weird, they just raise a lot more questions and STILL leave a lot to be explored with the fall of the DHARMA Initiative. But we also got some goodies in there! Mainly, as stated before, we follow the path of how Ben went from innocent child to the manipulative evil Ben we know today! Ben's mother Emily dies as a result of childbirth. She was 7 months pregnant. This seems to tie all of Ben's determination to save expecting mothers on the island very nicely. It provides us all sympathy for the tragic reminder Ben receives on each of his birthdays that he caused his mother's death. Ben's father, Roger, reminds him of this in his drunken stupors. We are introduced to Horace Goodspeed. Look into the names if you will and provide your theories on the significance in the comments! All I can think about is Stanley Goodspeed from The Rock! Horace was on the side of the road the day of Emily's death. It is yet to be seen if his significance goes further than just the link to how Roger and Ben end up on Fantasy Island. Yes for some 12ish years later (based on how old Ben appears), Horace was a part of the DHARMA Initiaitve and a bit of a hippie at that! He recruited Roger to be a part of experimentation taking place on the island. They arrive via the infamous DHARMA Sub (so we think once again...we once again still don't see them actually arriving!) But instead of working on experimentation, Roger becomes a WORK MAN. Ahhhh...ring a bell? Yep, remember that FILLER episode this season where Hurley found the DHARMA Van and the dead "Roger Workman" inside? Guess it isn't a filler episode anymore! Them genius writers, I'm telling you! We have a new Marvin Candle video to analyze (the Korean DHARMA video guy!) He welcomes everyone to the DHARMA Initiative. Discusses how the barracks are surrounded by a high frequency Sonar Fence to protect from the diverse "Wildlife." Hmm Smoke Monster or the "Hostiles?" He explains how every morning a new code will be provided if anyone wants to risk going beyond the fence. "There are properties on this island that exist nowhere else on this earth. Our Mission is to study these properties for the betterment of mankind and advancement of world peace" Betterment of mankind eh? Perhaps to start mankind all over again? Ben touches on the "world peace/harmony" aspect in the present time and how the DHARMA Initiative couldn't even co-exist with The Others. So...really nothing revealed in this additional DHARMA Video...just more to chew on! Ben gets a friend! Yes, he meets Annie and she offers the ultimate sign of friendship in the Apollo Candy Bar. Lots of adventure happen with Annie in these flashbacks, but the most important being the exchanging of Ben/Annie Dolls on Ben's Birthday. Something Ben holds sacred even in the present day. I wonder if Annie was part of the Purge. And when Annie suggested with the dolls that Ben and Annie would never be apart, I wonder if this holds more significance. Was she leaving? Or was this justification for Ben years later come Purge time? There's obviously room for more Ben flashbacks. Or at least...maybe some RICHARD flashbacks where we could learn more about Ben? I guess all I'm saying there is that if anyone is going to be offed in the season finale, Ben is still on the table as a possibility! But I hope not. That creepy dude is awesome! During Ben's education at the DHARMA Daycare (came up with that myself, you like? ), we learn that the Island is actually volcanic and that there had been an eruption a long time ago. Hmmm I'm guessing this was an important tidbit for episodes to come! Then there is the attack of the Hostiles, as DHARMA people always call the Others. (Even Desmond said it in season 2!) Lots of explosions and a lock-down in the classroom. But the biggest thing to come out of all of this was Roger recapping the story and saying they were driving back from the PLANE prior to the explosion. Hmmm....this must be a plane we have not heard about or seen before since it pre-dates both Flight 815 and the Nigerian Plane. And of course we must mention Ben seeing visions of his dead mother and the whispering he hears. Of course when he sees her beyond the fence...and Emily saying "It's not time yet Benjamen" we're supposed to look at the Purgatory themes and the Gates to Heaven. But on a surface level, it would seem it is not time for Ben to make his departure from the DHARMA Initiative just yet. Young Ben DOES in fact make an excursion outside of the fence one day. Gets the daily code "54439" (numbers fanatics...work your magic! ), the de-powering of the Fence makes the infamous Star Wars Tractor Beam deactivation sound that we so know and love (you know..on the Death Star! Come on, I'm not THAT big of a dork for making the connection!). Ben sends a white bunny through the fence. Ahh we learn of Ben's fascination with causing terror for cute little bunnies! Of course...he didn't paint an 8 on the back of any bunnies at this point in his life! More whispering is heard and then enter Long haired hippie Richard. Huh? He's on the island already? He was an Original Inhabitant of the island? And how on earth does he look like he's the same age while Ben is only 12? I could've sworn Present Day Ben was the same age as Richard, if not older. Now, I'm sure Richard is supposed to look younger with the wavy hair...and it's just because it's the same actor playing him that he looks older....but still...how much older than Ben could he really be in the present day? Anyway...Richard looks VERY intrigued that Ben sees visions of his Mother and Hears her talking to him. But he asks Ben to be patient. Kinda like Emily said "it isn't time yet." From those 2 exchanges, it would seem that the Smoke Monster/Visions CAN be tied to the OTHERS and they are manipulating Ben. Or it could be seen as Richard seeing hope in Ben for being able to experience some of the Island's powers. And they have plans for Ben to be their leader one day. Years later...we see an older Ben (it would seem still a bit younger than present day Ben but not TOO much younger) working as a WORK MAN right along with Roger. They take the Van out on Ben's Birthday to the Pearl Station and then to Mesa (never heard this before, have we?) Lots of exchanges of how Roger ruined Ben's life for him and then BAM....GAS City! At 4:00 sharp, Ben kills his father and leaves him to rot in the Van at Mesa. How the Van is turned over when Hurley found it? Yet to be seen. But what IS seen now is that 2 times Richard has convinced outcasts to kill their fathers to become ONE OF THEM. As Present Day Ben says...he CHOSE his allegiance when it was necessary. Why do I say Richard convinced him? Because when we return to the Barracks the entire DHARMA community has been Gassed and killed. Yes...Mikhail telling us of the PURGE was accurate. And we finally saw it first hand! Question to part with from this section: Was Kelvin working for DHARMA at this point? It would seem he would have to be. But he wasn't there for the purge. He was pushing the button. 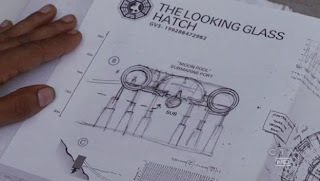 Maybe this also confirms Ben did NOT know about the Swan hatch until he was brought there by Sayid. Yes, this is the storyline that has all of our heads spinning once again. As if we didn't have enough on our plates with Time Travel. Now we have imaginary friends to deal with! Anyway, Locke's back with dead Daddy and wants some answers! So do we John, So do we! Here's what went down. It's Ben's Birthday again which he seems adamant about reminding to Richard. As if maybe Richard promised Ben he'd never forget his Birthday some time ago. Perhaps a promise that he made in order to persuade Ben to help with the Purge? Ben still has his Annie Doll with him to this day too. I just have a feeling this scene will hold more significance with future flashbacks. 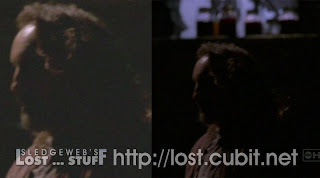 Ben realizes the recording is missing, thinking Richard brought it to the Medical Hatch. Does he catch on that Locke gave it to the survivor camp? We're not meant to think so. I'm going to say no for now. Ben has a sit down with Locke once he returns. Pours some whiskey, which seems to be a recurring theme on the show these days. He tells Locke that he really doesn't have all of the answers. But DOES say he's not the leader and tells us about Jacob. How Jacob only speaks to Ben and everyone believes that Ben does speak to Jacob. Locke has his suspicions right away. Keep in mind...the OTHERS seem to be getting tired of Ben's quest for fertility on the island. It just seems that Ben took charge of the OTHERS after a key occasion where he encountered Jacob for the first time (maybe seeing his Dead mother ties into this somehow...where the others view Ben has having a gift?) And since no one else has communicated with Jacob, THE OTHERS were willing to follow Ben and whatever Ben wanted to do. And it seems Ben used his manipulation skills to convince everyone that Jacob WANTS them to pursue the fertility on the island issue. Maybe even convince everyone that Jacob exists? I'm getting ahead of myself. And I'm definitely just theorizing by the facts given. Mikhail shows up and explains why he's still alive (as promised, in a sentence). The Pylons were not set to a lethal level. And just like that he lives. He explains to THE OTHERS about Naomi. Clearly, Naomi is not with The Others, as this comes as a shock to everyone. Of course Locke tells the entire Camp that Ben is taking him to see Jacob. The whole camp is taken aback. And notice how no one does a thing when Locke starts to beat the crap out of Mikhail. This seemed to show their loyalty behind Locke over Ben, which was the point Locke was trying to prove. Everyone is fed up...and if Locke is the CHOSEN ONE, or whatever....why shouldn't HE be able to go see Jacob? Again...just my take on it all. So, against Ben's wishes (so we think), he must bring Locke to Jacob. Alex gives Locke a gun for the Jacob encounter. What is THIS all about? Has Alex met Jacob? Or just heard stories? Ben suggests Jacob will not appreciate the intrusion. He summons people and is not someone you just go and see. Could be more of Ben's fear and attempts at manipulation. He seems to have his own agenda, and other people coming in contact with Jacob would ruin his hold on people. So was that a river of ASH that Ben and Locke came in contact with? Perhaps from the Volcanic Eruption? Does this hold significance to Jacob's location? Why did Ben look so scared to cross the Ash? I have no answers, just observing! And then there is the Jacob encounter. This is probably where the LOST fans are divided in Half. They arrive at an old creepy house in the middle of the jungle. Ben mentions Jacob is like Locke when it comes to use of Technology on the island and requests Locke to turn off flashlight. After Ben does the ol "There's No Turning back once door is open" saying...we enter the house. 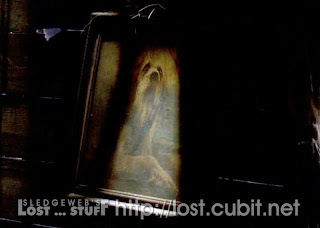 We see a Portrait of a Dog (a creepy dog! ), Jars of weird colored fluid, and of course Ben talking to his Invisible friend! I was with Locke.....Ben is a loon! He somehow was keeping his hold over the others by lying to them! Locke says some awful words to Ben that he may learn to regret. He walks away and then hears in a creepy low voice "HELP ME." He turns the flashlight on...and all hell breaks loose! The house shakes.....jars fall over, the chair rocks....windows break....lantern lights the inside on fire. 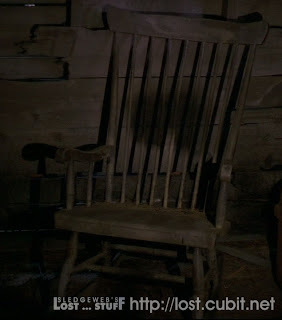 Ben yells at the chair and gets pushed against the wall.....and then....IT HAPPENS.....we see a brief glimpse of a Man sitting in the chair! Okay...so we need to break this stuff down right? First of all...did anyone see that shadow on the chair when the house started to shake? Some suggest this was ol' Smokey appearing again. It kinda just looks like an accidental shadow to me. Plus, it wasn't accompanied by the trademark Smoke Monster Sound. Then there's the quick glimpse of JACOB. The hair is a bit deceiving, but look at the shape of the face and forehead. Doesn't that look a bit like John Locke? I was mulling around a theory in my head yesterday that perhaps Locke is unknowingly Jacob prior to seeing the episode. So, this might be me just seeing things. I also mulled around the possibility that it could be Christian Shepard (whom we never actually saw die...just saw his body...but now that they found the bodies of the Flight 815 passengers...it made me start considering that again). But who really knows. We can guess about this all day....but it will be revealed to us in time who Jacob is. And if Hurley's foreshadowing in Expose' is correct, it will be in season 4! But this kinda confirms it won't be Lando/Billy Dee Williams! So then there's the ol "HELP ME" thing. Ben seemed very surprised at Locke saying he heard something. And the fact that LOCKE heard "Help Me" could say it all. Ben clearly didn't hear Jacob say it. Maybe he's never heard Jacob at all? And can he really see him? Or was he really hoping that bringing Locke there would shed some light on the situation? Again...we can all theorize...but we just need to let this one play out. But why "Help Me" Is it Help free me from Ben? Help me because I'm invisible? Help Me Help You? Help! I need somebody? not just anybody? Yeah....I have no idea. I'm still trying to figure out why he was invisible! Locke still was trying to figure out exactly what he saw, claiming it was all a big show to Ben. (He clearly saw Jacob! They showed his eyes fixated on it!) Ben reveals that he DID lie about being born on the island and then shows Locke the DHARMA Grave. Ben is persistent in finding out what Jacob said to Locke...and then he SHOOTS Locke! WOA!!! Why did he do it? "BECAUSE YOU HEARD HIM!" Hmmm....is that because he doesn't want Locke telling The Others what he heard? Would seem so, wouldn't it? Perhaps Jacob will help Locke? Locke does have incredible healing powers. But we've never seen anyone recover from Bullets. Can they really kill John Locke after he heard such an important Message? I say no....of course...unless Jacob IS Locke and there are 2 Locke's from 2 different times on the island. That's a bit crazy, though isn't it? I'm sticking with SOMEHOW Locke will survive this and become more determined than ever to SAVE the island...OTHERS and Survivors alike. Hope I didn't lose anyone in that rambling. Every detail of the episode seemed so important! I didn't want to leave anything out! Very interested to hear everyone else's thoughts on the crazy episode. Liked/Disliked? Theories? Bring em' on! We can figure it out together! Wait...we still have more to discuss! 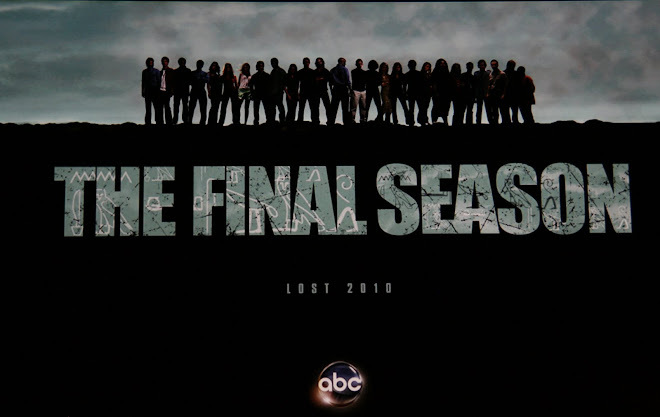 In case you've been living under a rock...or I dunno...actually doing work, you probably have heard that LOST producers have worked with ABC to confirm an End Date for LOST! Took me awhile to get on board but we have 3 Seasons left of 16 episodes each. For now each season will run from February to May and the show will end in 2010! If you're having a hard time getting on board, maybe you want to read the entertainment weekly interview with Damon and Carlton (producers). I thought it was fantastic! Careful on Page 3...they reveal a few tidbits of season 3. One of them being that we'll meet Jacob in the episode that just passed. They also compare Jacob to the Emperor in the Star Wars saga....and how we didn't even meet the guy until Return of the Jedi, but he was always mentioned leading up to that. They claim Jacob is just as important to LOST as the Emperor is to Star Wars. But their rationalization of the final 3 seasons was what captivated me. If you think about it....they had a 5 season plan. Each season being 24 episodes (so that would be 48 episode). So now....we have 3 seasons of 16, which is also 48 episodes. They said 24 episodes a season is too tough for them and leads to some of those bizarre episodes we've had where really nothing happens. 3 sets of 16 is better to work with and also gives them more time to put some thought into how they unveil the mythology to us! But we can all be assured that the answers are coming and they already started this season! We're more than halfway done! I'm excited and totally onboard! Finally, I'd like to end this blog by welcoming all of the newcomers who discovered the blog last week! Thanks for checking it out! Please keep on coming back and sharing your thoughts. And share with your friends! Hell, share with people you don't even know! I was really excited to see the Comments section taking off! This was always meant to be an interactive discussion with other fans of the show! Well my fellow Losties, 2 more blogs for the season and I'm sure the episodes are going to be fantastic! I'll see you next week to discuss!